Tomorrow is April 1 and the beginning of NaPoWriMo. That’s ‘National Poetry Writing Month’ for those remaining few of us who do not feel compelled to abbreviate, hashtag, or bastardise our vocabulary skills. And for many poets around the globe I suspect the day will trigger a series of daily rituals and commitment to do precisely what I vow not to do: Participate. For me, the ‘NaPoWriMo‘ tag line with its missing consonants’, spaces’, and textual geometry simply represents the dried out husk of poetry itself. The act of performing, like a puppet on a string, to satisfy the quirky demands of some literary authority no longer feels like an artistic process. It becomes an extrusion of passion, direct from the soul nonetheless, with the hapless victim of poetry becoming a sacrificial deity throughout the month. Nope. Pumping out 30 poems in 30 days is an unwanted labour. You may learn to love the outcome, but by no means does it require love for it’s initial conception. I did participate in it a couple of years ago and learnt the hard way about what a forced poem left me with. The process left me almost completely dried out of inspiration and willingness to write. I became despondent with the local poetry community about their haphazard engagement of local poets and poetry lovers alike. The whole event made me super-critical and hypersensitive to how authorities managed poetry and writing campaigns. This must appear to be an overreaction to things, but certain facts and conversation highlights with other poets started to stand out and reinforce my suspicions in the months that passed by. Being ‘published’ as a poet started to mean ‘you’ve paid handsomely for the service to the local University press’. Becoming a ‘reputable poet’ only seems to be attainable if ‘you’re connected’. Having landed literally hundreds of poems of various form and nature, the majority of which actually rhyme, I quickly questioned my position in the wider poetry community. I won’t go into the details about which particular social media accounts either declined my volunteering efforts, donations, and offer of support to local events, but it is fair to suggest that my presence as an Independent Publisher was simply not desired. NaPoWriMo eventually opened up a hidden world and taught me more about poetry than I could ever have hoped for. More importantly, I learnt more about myself and my morale fabric within a world where personality aesthetics, social connectivity and empowerment through payment appears to be the strongest currencies. My name is P.J. 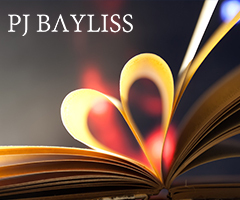 Bayliss and I am an Independent Author.